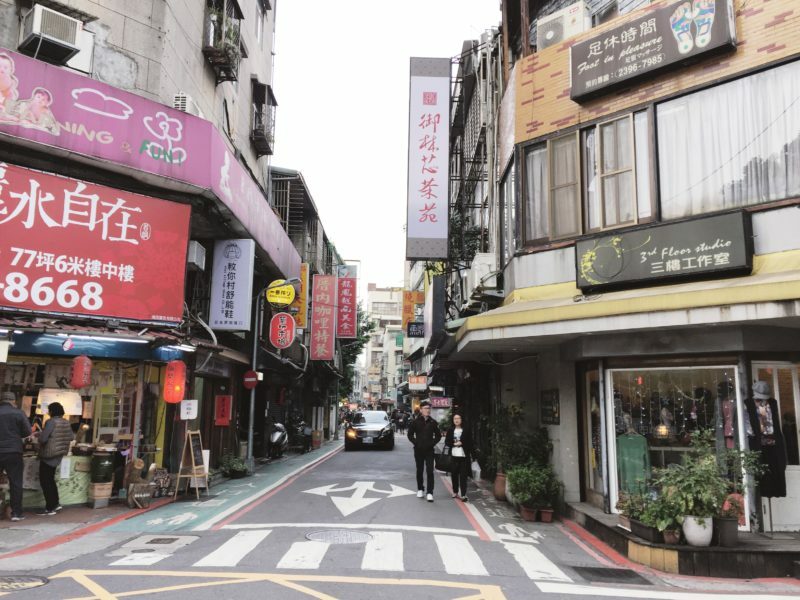 I didn’t lack inspiration for my itinerary in Taipei; I had friends who were generous with their suggestions on where I should go and what I should do. One even sent me a copy of her itinerary when she went to Taiwan. Despite this, I went to Taiwan like I had no idea what I’m about to do. I have forgotten about the suggested itinerary, the transportation and spots to visit, and other pieces of advice thrown over chat conversation. Yes, I can be an askhole. There are dangers in refusing to acknowledge in other people’s advice but I can definitely understand the lure. The prospect of finding out things on my own was delicious for me. This is how I found out TourMeAway while randomly googling for things to do in Taiwan. 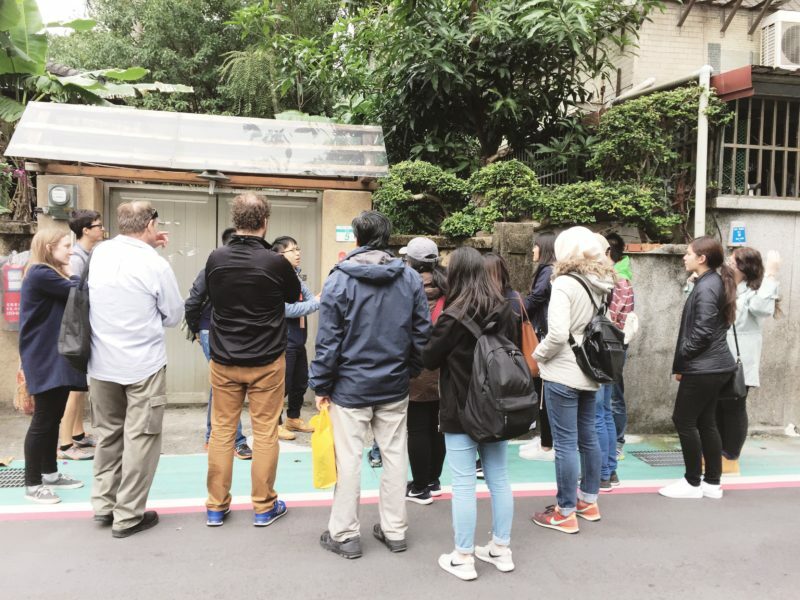 I discovered that there is an option to see Taipei by joining a small group of tourists in a tour led by a few locals. And the best thing about it, it’s free. But first, the video that I made of the tour. 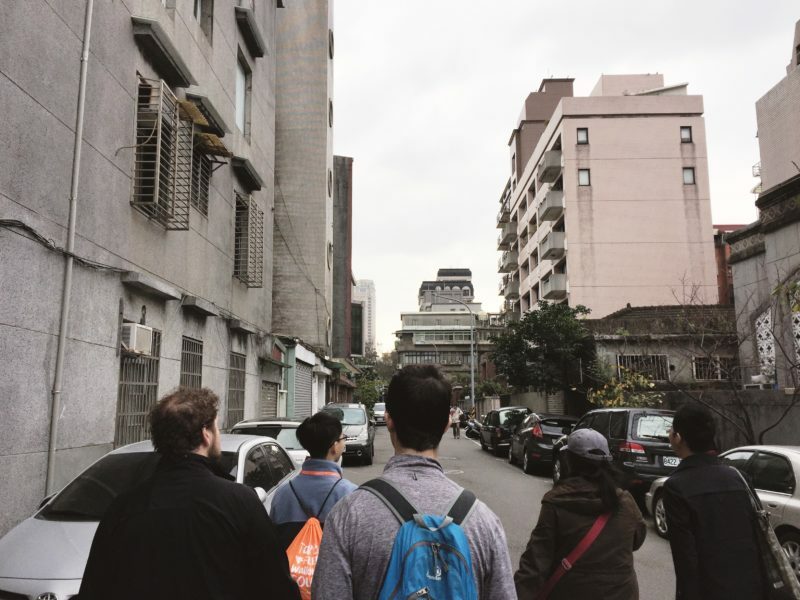 TourMeAway offers free English walking tours in Taipei by a group of travelers from Taiwan who like to call themselves the TMAyan Tribe. 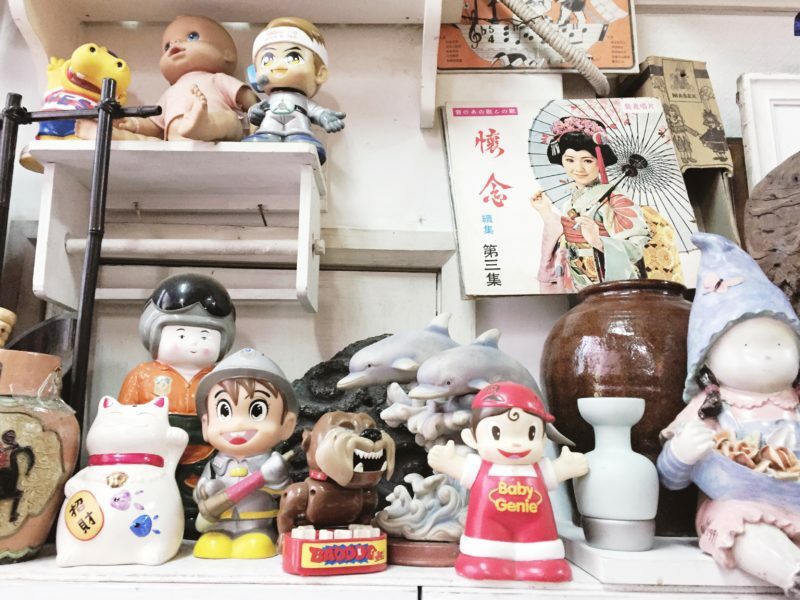 The group offers different kinds of walking tours that would expose you to Taiwan’s history, culture, lifestyle, food, even nightlife. 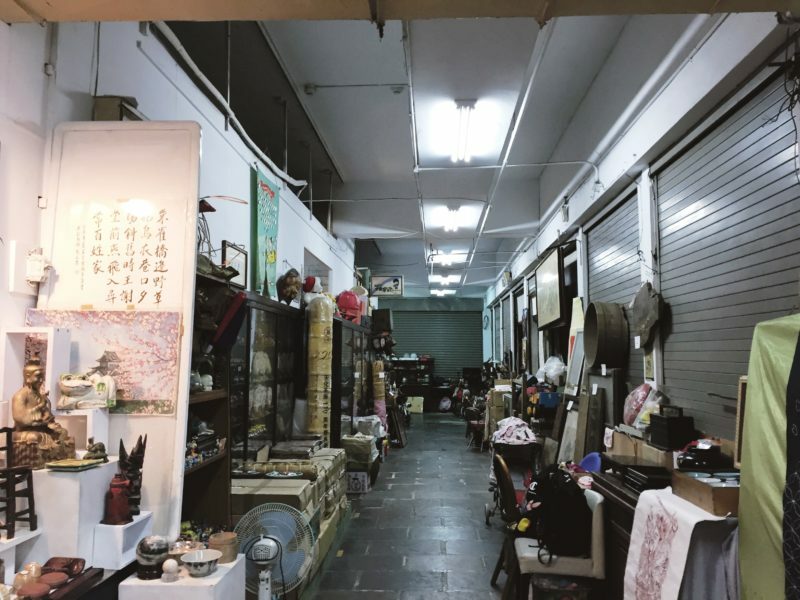 They have 6 kinds of tours, such as Old Town Taipei, Taipei Chill Out, Longshan Temple Tour, Hunger Game, Pub Crawl, The Vintage Tour, and Private Tour. I booked the Taipei Chill Out tour on their website. This one is available every Thursday and Sunday and begins at 2:00 p.m. 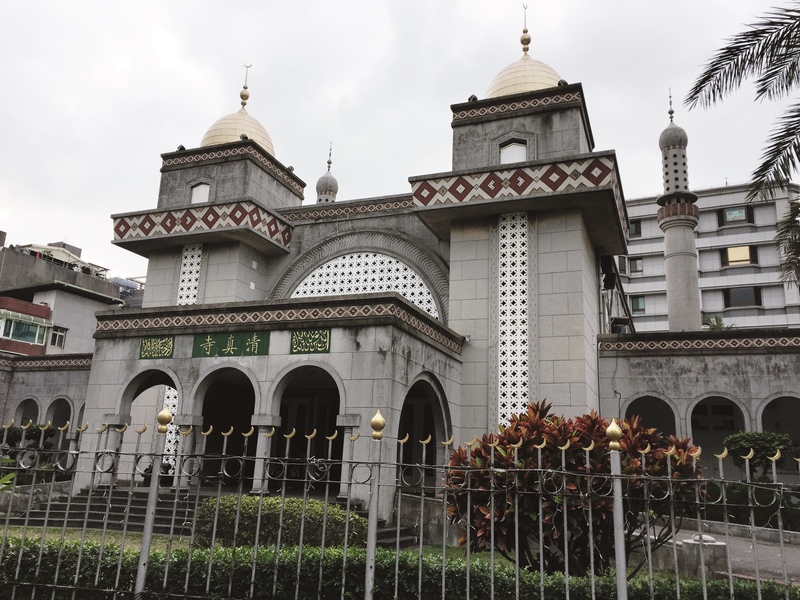 The tour lasts for 3 hours and the meeting place is at Da’an Park Station. I was supposed to go with Christine for this tour, but she failed to show up in time. We were guided by 3 TMAyans, Kai, Bridget, and Pin-Ye. All of them speak good English most especially Bridget. We started by introducing ourselves with one another, there were Chinese, Americans, Argentinian, Australia, etc. I was the only Filipino in the group. This tour would take you to places where you can simply take it easy or chill. If you are a hipster or have a hipster tendency, this is for you. 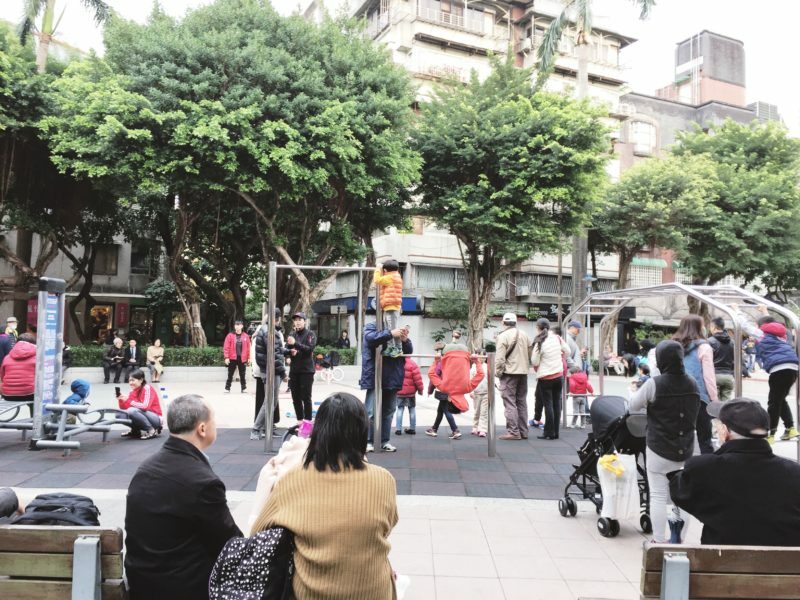 In 3 hours we were led to the following locations: Da’an Forest Park, Heaven Road, Qingtian Neighborhood, Yong Kan street, Antique Boutiques, and Chiang Kai-Shek Memorial Hall. Da’an Forest Park or Daan Park is a 26-hectare public park that locals like to frequent for various outdoor activities, such as picnic, roller skating, strolling, jogging, bird watching, among others. It was opened in in 1994 and it is meant to function just like other city parks like the Central Park in New York, USA and London’s Hyde Park in England. It has two ponds, pavilions, strolling paths, skating rink, jogging loop, playground, an amphitheater, and underground parking garage. 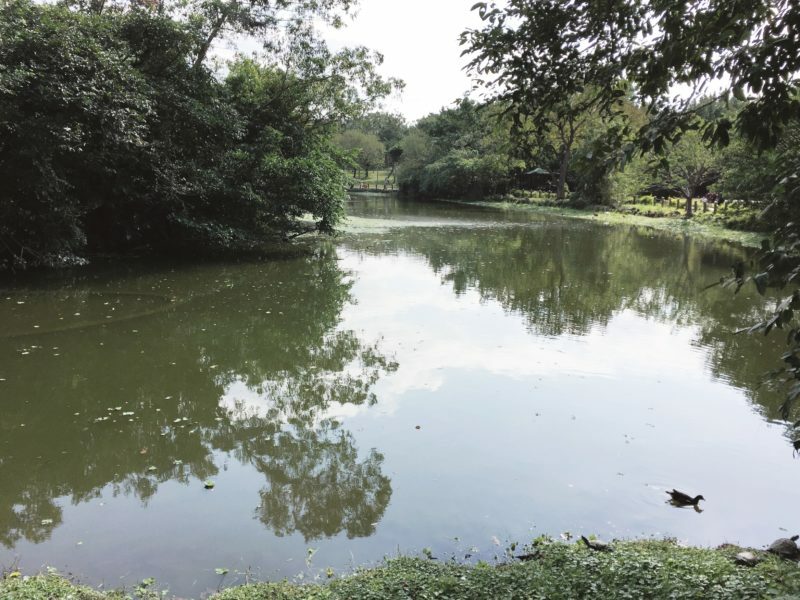 The park is also home to a variety of animals, in fact, in the pond I’d seen some turtles and birds of different kinds. Also as I was walking there I spotted a man feeding a squirrel from one of the trees. 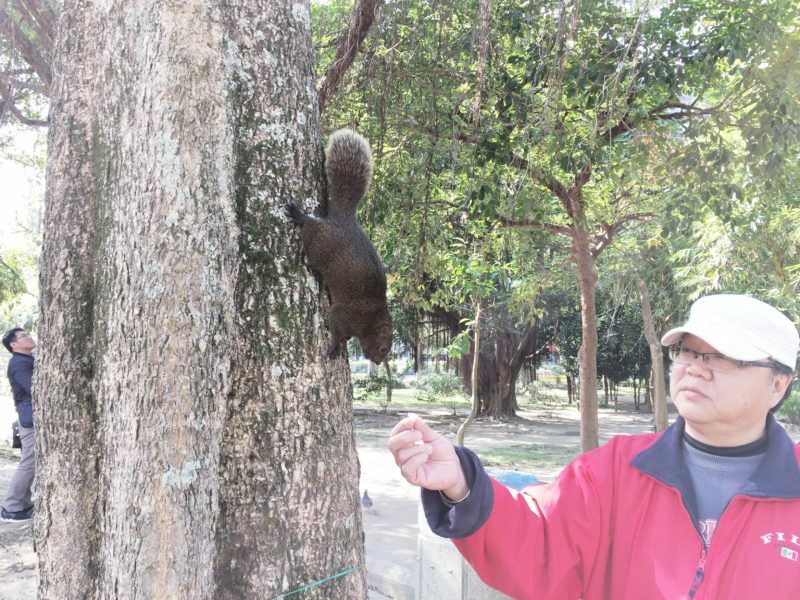 The park is not just for recreation, Kai said that Taiwanese also use it as an evacuation center when there are natural disasters such as typhoon and earthquake. About the typhoon, apparently the Taiwanese people like them because it usually leads to suspension of school and work. 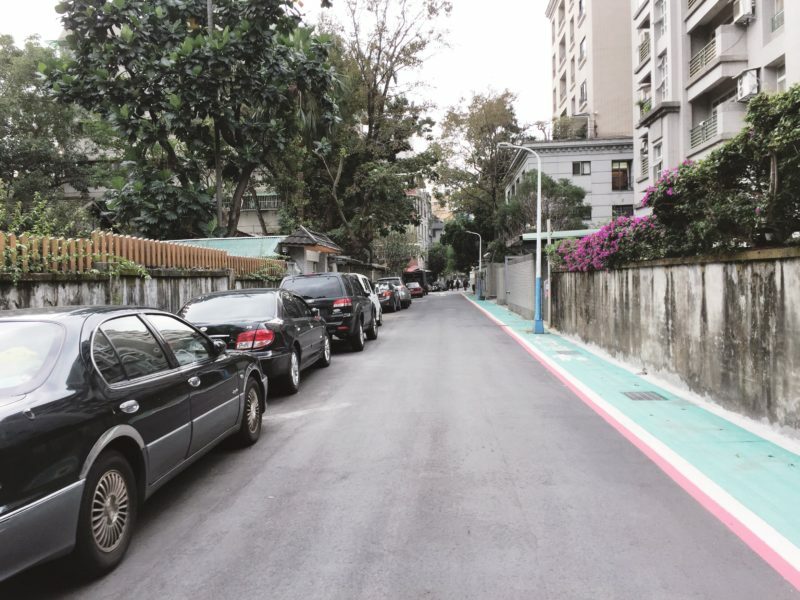 Our second stop is Xinsheng South Road also known as Heaven’s Road. Kai let us guess why this long stretch of road is called as such but nobody was able to come up with a wild idea. When I saw a Catholic Church, I thought that answers it, maybe it was called Heaven’s Road because of this church. My hunch wasn’t right but it wasn’t entirely false either. You see, Heaven’s Road is named so because of the 7 religious buildings that are lined up on this road; there’s a church, a mosque, temples, and shrines. 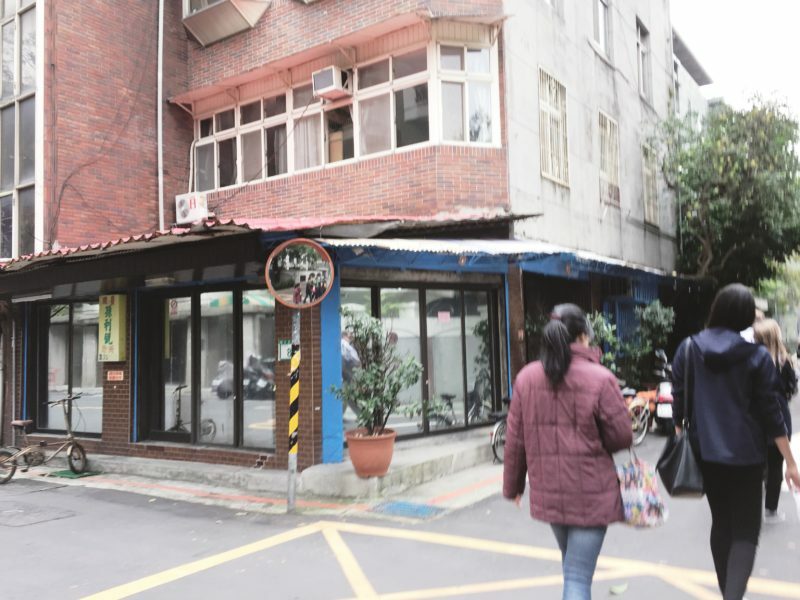 Somewhere along the road we turned right to what they call as a “hipster neighborhood.” It’s called Qīng tiān where residents are on the affluent side. 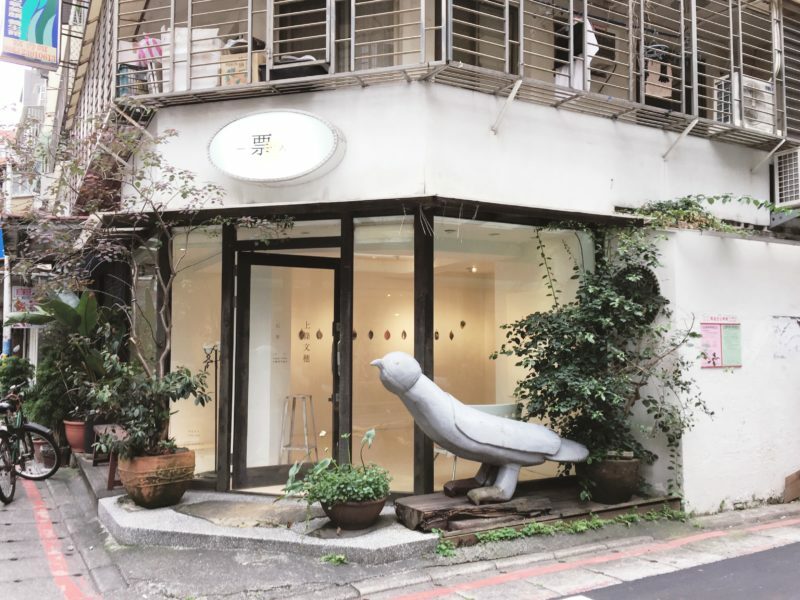 Here you can find Japanese-style dormitories, antique shops, fashion boutiques, restaurants, and tea shops. More than the hipster vibe of this neighborhood, the most memorable thing that I found here is a taxi and a car who met on the intersection. Why were there memorable? Well, they freaking blocked the road for more than 30 minutes because none of them wanted to give way to another. I swear to you they made quite a scene that I wasn’t able to listen anymore to the guides because I was busy waiting for the two vehicles to move, wondering who would be the first to surrender . We entered an antique market where you can also find bricks of teas. 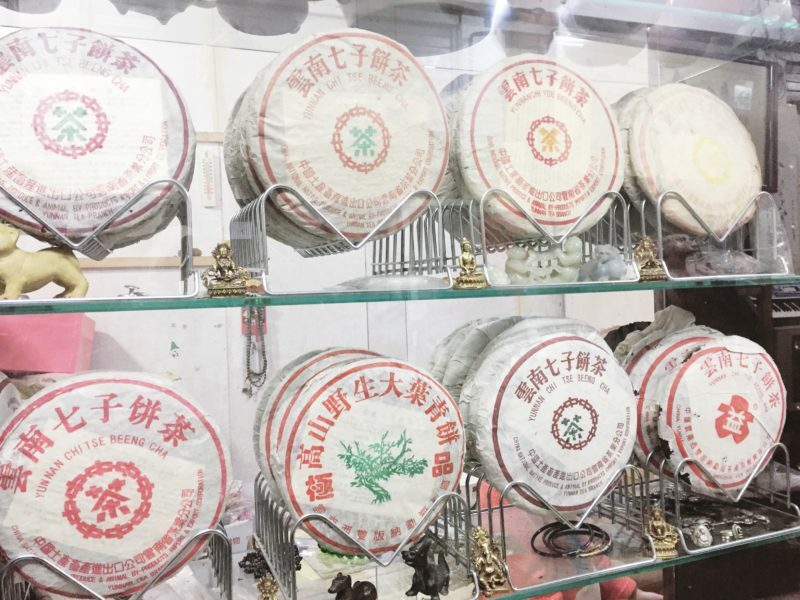 Those big round things wrapped on paper in the photo below, those are tea bricks. 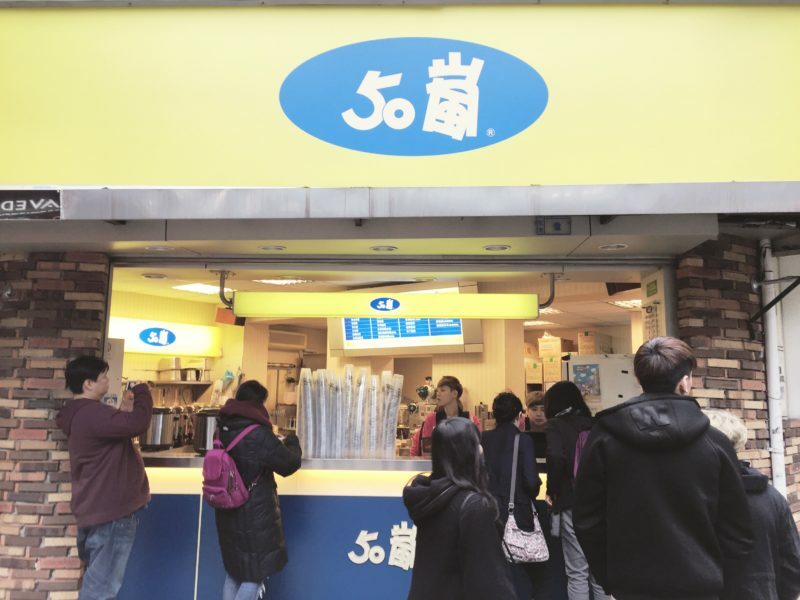 Taiwan has a big tea culture, in fact, it’s the home of the bubble milk tea. Bridget said that they have 4 kinds of teas; oolong, green tea, black tea, and oriental beauty tea. They love tea because of its medicinal properties to help combat the 3 Hs: Hypertension, Highblood, and High sugar. By 4:00 p.m. I was ready to eat. Good thing we already reached Yong Kan street where found a string of food establishments. The guides recommended that we try the scallion pancake, bubble milk tea, beef noodle, and mango shaved ice. However, they only gave us 30 minutes to buy the food; they were pretty strict with time, so I didn’t get to explore Yong Kan as much as I would have liked. Out of all their recommendations, the only thing that I was able to buy is chocolate milk tea from 50 Lan (50嵐). Frankly, the milktea tasted no different from those that I tried back home. I also had the most delicious calamari I have ever tasted in my life! But let’s save that info for later when I wrap up everything that I have ever eaten in Taiwan. 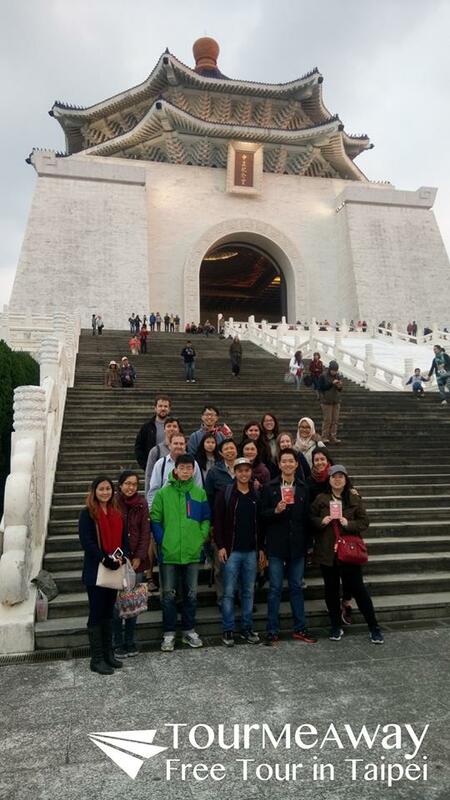 And the last stop of our tour is one of the famous tourist spots in Taipei, Chiang Kai-shek Memorial Hall. Chiang is a former president of the Republic of China and this memorial hall was built to honor him. You can read more about this place in my previous post on this link. Dress for the cold: I went in January and it was unbelievably cold, the temperature played between 14 to 17 degress Celcius. If you are used to this kind of temperature then good for you, but if like me you came from a tropical country and already consider 20 degrees as cold, then I highly advise that you dress appropriately. Aside from wearing a thick jacket, I found gloves, scarf, and bonnet quite helpful. Wear flat or comfy shoes: This is 3 hours of walking so this is no time to channel Posh Spice. Wear something that you can take off easily because at Da’an Park, they made us walk over a path of stones. I struggled in and out of my boots; not a pretty sight. So yeah, wear a pair of footwear that can be easily taken off. Bring water: Sure the cold may not make you sweat, but you still need to drink so do not forget to bring your own water. In my case I didn’t get to drink until we reached Yong Kan street and I was already a bit thirsty by then. Be punctual: I cannot emphasize this enough. In the Philippines, we like to make everybody wait, in Taiwan if you don’t show up in time nobody’s gonna wait for you; you will be left behind. Engage with people: Do not be like me, I repeat, do not be like me. The reason I didn’t enjoy the tour as much as I should is because I kept mostly to myself. This is a great opportunity to make friends so don’t be like me, go out and talk to your fellow tourists. Ask the guides: The guides offer not merely valuable information on the history and culture of their country but a local insight on which place you should explore that not many tourists know. Bridget did give me an advice, it’s just that I didn’t have enough time to go to the place that she suggested. Bring money: The tour is indeed free, but they ask for donations so that they can continue with their operation. Any amount will do. All in all, the tour has been great. 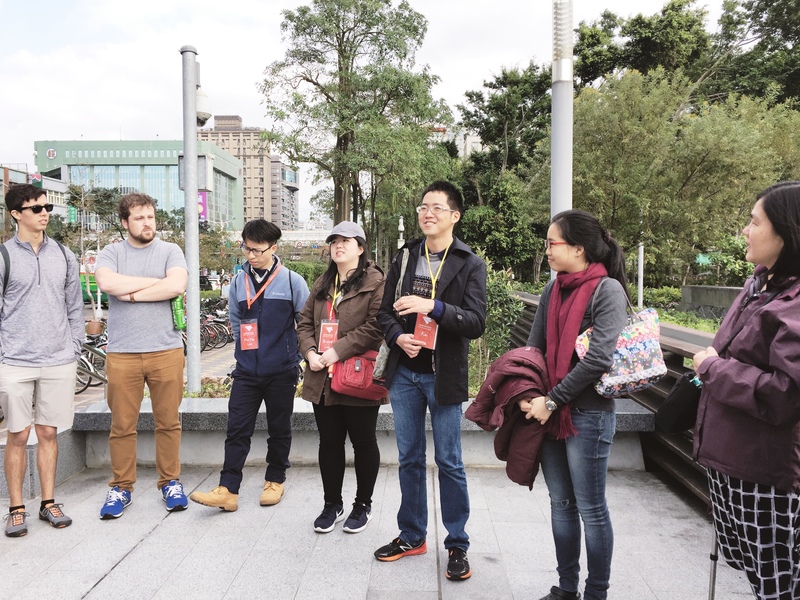 True to its word, it was chill and relax, the guides are well informed and eloquent in English and I was able to discover some parts of Taipei that I wouldn’t have known had I not joined this tour. Would I recommend TourMeAway, 100% yes. In fact, I am thinking of booking a tour with them again when I return to Taiwan. If you too want to book a tour with them, here is the link. Hi Peach, unfortunately, I don’t remember anymore how much did I give as a donation. Sorry! You seem to have covered a lot of ground with this guided tour in just 3 hours. What I hate about the guided tours is that they try to cramp in a lot in very less time. how was the pace of this one? Did you keep running on your toes, or, as the name suggests, it was a chilled tour? Bongga naman SEA tour mo eh! I’m planning to go back if not in December in January. And when I want to be there longer. Taiwan had been moving up my to-go list exponentially in the last year. Reading blogs, I like it that I get lots of approaches to how the country is best explored. I haven’t been in Taipei. I wanted to visit the place someday and been checking out airfare promos. Unfortunately, I can’t travel this year since I have promised my kids somewhere else. Thank you for sharing TourMeAway with us. Now I have a place to ask for tour help when I visit Taipei in the future! It made me curious what’s the real reason why heaven’s road was called such. And I agree with your guess bec, well, if you’re in Taiwan and you want to be step closer to heaven’s door, this is the place to be, regardless of your belied. A friend recently visited Taipei and its very nice. Almost everywhere is photograph-worthy. Well, I am very hopeful I can visit Taipei some time. 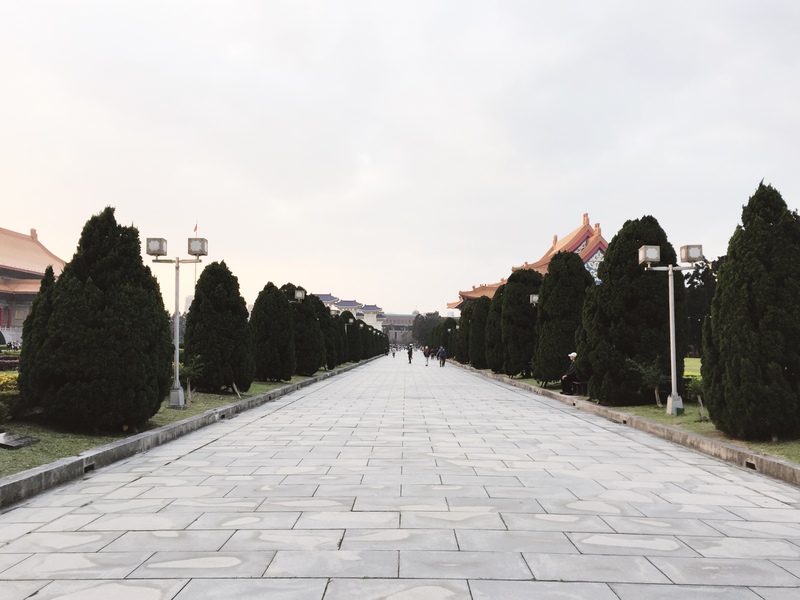 Taipei is one of my dream destinations. Actually I had a lot of dream destinations and I want to tour around Asia. Seeing your photos on the tour, it gives e a chilly vibe of the place. They have beautiful structures and seeing how you enjoyed your trip makes me think that their citizens are kind and welcoming. thanks for recommending TourMeAway…. I feel it’s the most cost-effective and clever way to get around the city.. i wonder how much would be an ideal donation for their group? What an incredibly comprehensive post of your time away! I love how you’ve included different type of media, as well like your cute video and beautiful images. It’s very well done! My husband used to go to Taipei a lot for business, and he’s been bugging me to come and see the city with him. For some reason, I was never interested. That was until I read your blog. Dude, you had me at the word “free”! Hahaha. But seriously, you piqued my interest- now I want to go to Taipei just to experience the different tours myself..
Well I sure love the sound of a “chill out” tour! Sounds like my kind of day. The only tours we ever do are walking tours so I will keep this contact in my todo list for Taipei for sure! We want to go soon so I will try and remember! Thanks for the tips. Yes I will definitely recommend Taiwan to anyone especially to families. Though I didn’t see a theme park, there are lots to do there. 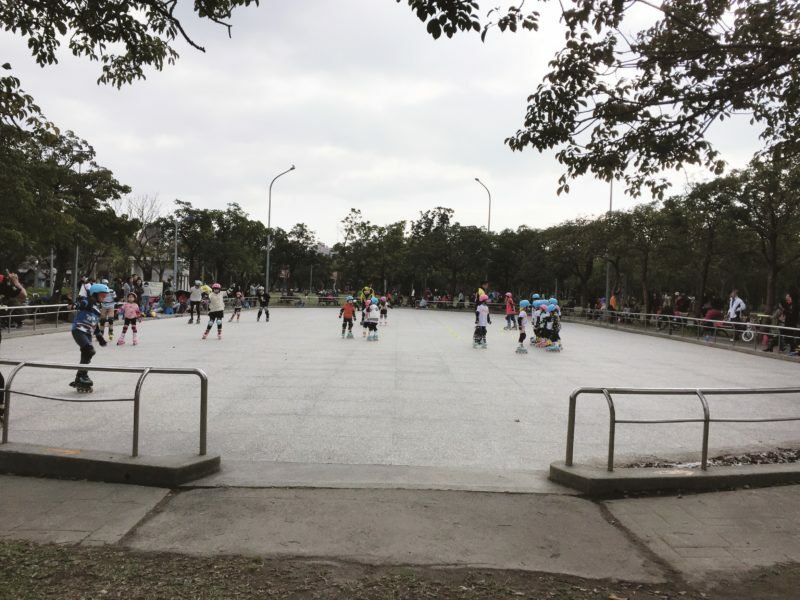 There is one park in particular, Da’an Park where locals go to chill. 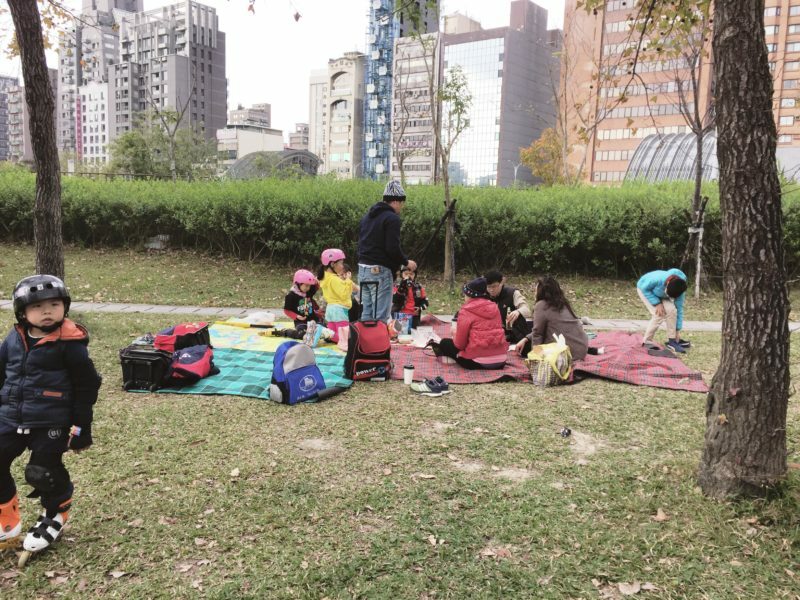 I saw families having picnic, kids having fun in the skating rink. For sure you and your family will love it. Taiwan is safe, the locals are helpful, though signs are written in Chinese they also have English translation. I just love it and I’m sure you will love it too. That was a wonderful tour even if it was a bit rushed. I liked the Heaven’s Road concept with all religious buildings. I will remember TourMeAway services if I get to Taiwan. I have done a couple of these tours during my last trips and they are an excellent introduction to a city (plus usually the guide is very motivated). 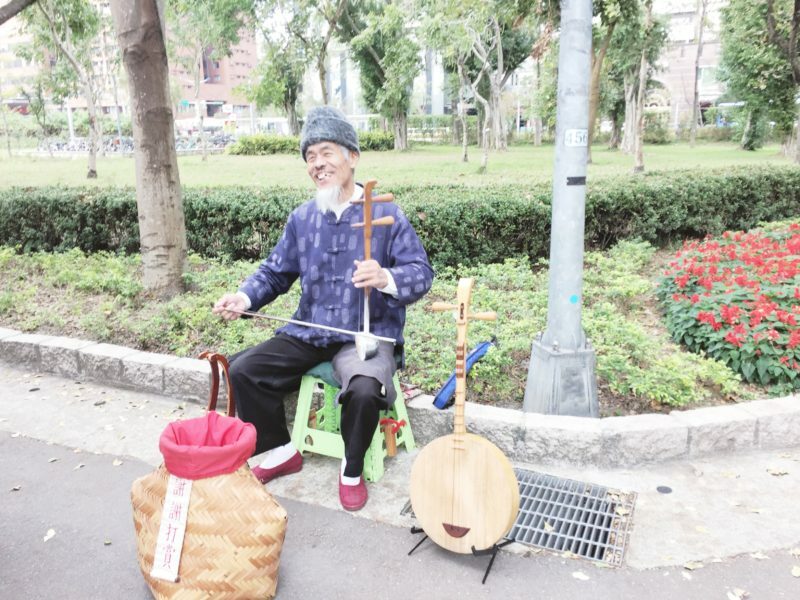 I always wondered if there was sth interesting in Taiwan to see, it seems it worths the detour. I like free walking tours organized by local tour guides. It offers a glimpse into art, history, culture with lots of information coming from first -hand experiences. They also try their best to engage tourists because their tips depend on their service throughout the tour. Their personal stories are often woven into their narration and I learn a lot more compared to exploring cultural places on my own. Will definitely keep Tour Me Away in mind if we do go to Taipei one day.